In biology, roses are divided into seven main taxonomic levels called taxa. These division separate the different species or kinds of roses, of which there are many. Within these taxa there are many subdivisions, such as subclass or subphylum. 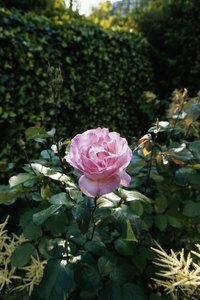 Roses belong to the same kingdom and phylum as many other plants, but the division becomes more specific as you work down the taxonomic levels. Kingdom is the vaguest division of the taxonomic levels and tells you little about the plants within it without knowing the other taxa as well. Roses are part of the kingdom plantae, which encompasses all plants, including trees, weeds and flowering plants. However, plantae are also divided into two taxa: broyophytes, which includes mosses, and vascular plants which includes roses. Phylum divisions are marked by names that end in phyta. For example, roses are part of the magnoliophyta, or broadleaf flowering plants phylum. This phylum is characterized by the production of seed through flowering and in most cases, broadleaf leaves. The magnoliphyta is a large, diverse group of plants, with both woody plants, such as trees and shrubs and herbaceous plants. Phylum can be further divided into class. Magnoliphyta plants are divided into two classes called dicots, or class magnoliopsida and monocots, or class liliopsida. The difference between these two is in the flowers and leaves. Dicots have net-like veins on their leaves and the flower parts are produced in multiples of four or five. The monocots have parallel-veined leaves and flower parts that are produced in threes. Roses belong to the class magnoliopsida. This large taxonomic class is separated again into six subclasses. Roses are part of the order rosales which includes nine families of flowering shrubs, trees and herbaceous plants. This order also includes the mulberry family, the elm family and the nettle family, as well as five other smaller orders. These plants typically have alternate leaves with stipules and the flowers contain five sepals and petals, several stamens and produce a large amount of pollen and nectar. Rosales plants often have thorns or stiff hairs and the fruits of these plants are "achenes," or dry fruit, drupes or aggregates. Orders are further divided into families based primarily on the similar reproductive structure of the members within them. The rose is part of the rosaceae family, which encompasses about 3,100 plant species. Rosaceae includes many fruit plants and other species of flowers as well. This family shares reproductive characteristics such as seed location and growing habits. In the rosaceae family, there are obvious physical differences, such as fruit that may be small seeds, pomes, drupes or clumps of drupelets, but they do share physical traits as well. For example, rosaceae members have five-petal flowers that are radially symmetrical. The flowers of these plants also contain several stamens and have a cup-like structure. Beyond the family taxonomic division, roses are divided by genus and then species. The two are often grouped together because biologists use a binomial system in which the genus name and the species name are used together to identify a plant. Genera are groupings where members have more characteristics in common with each other than with any other genus in the same family. Roses belong to the genus rosa, which includes more than 200 species of plants. The genus is further divided by species based on genetic similarities, making the division so diverse it is difficult to describe each species of rose in general terms. Plants in one species are grouped together because they have fewer genetic differences within their species than they do with other species.